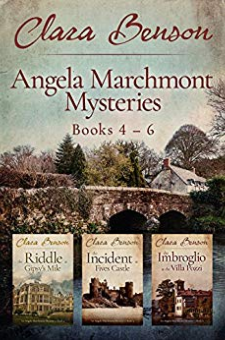 This omnibus edition contains books 4, 5 and 6 in the Angela Marchmont Mystery seriesAngela's adventures continue in this series of light-hearted and charming 1920s mysteries!Includes:THE RIDDLE AT GIPSY'S MILE (Book 4)Lost in the mists of the Romney Marsh, Angela Marchmont stumbles upon the body of a woman whose face has been disfigured—presumably to prevent recognition. Who is she, and what was she doing out there in the middle of nowhere? The search for answers will take Angela from a grand stately home to London’s most fashionable—and disreputable—nightclub, and into a murky world of illegal drinking, jazz music and lost souls.THE INCIDENT AT FIVES CASTLE (Book 5)It is Hogmanay, and Angela Marchmont is at Fives Castle, the Scottish seat of the Earl of Strathmerrick, to see in the start of 1928. But when she finds out that the Foreign Secretary, the American Ambassador and the Head of British Intelligence are also among the guests, Angela begins to suspect that something momentous is afoot. Before long, they are all snowed in and a body is discovered, and Angela soon finds suspicion directed against herself...THE IMBROGLIO AT THE VILLA POZZI (Book 6)While holidaying in Italy, Angela Marchmont is persuaded to postpone her trip to Venice and go to Stresa instead, to investigate a pair of spiritualists who are suspected of defrauding some of the town’s English residents out of their money. But what starts out as a minor matter swiftly becomes more serious when one of the residents in question is found dead in the beautiful gardens of his home, having apparently committed suicide.Seduced by the heady sights and scents of the Italian Lakes, and distracted by an unexpected encounter with an old adversary who seems bent on provoking her, Angela sets out to find out the truth of the affair and resume her journey to Venice before she forgets herself and loses her head—and her heart.